Custom Store Home Page, Custom Navigation, Custom Logo, Invoice Logo, Profile Page Logo, Clean up of old listings that included stripping an existing Auctiva template. Updated Customer Terms and Policies. 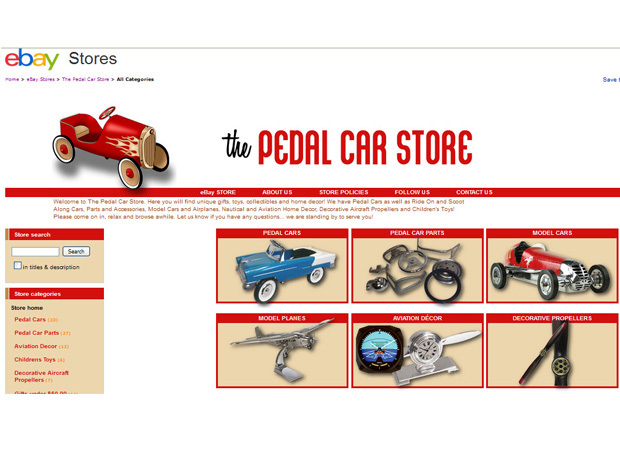 Carl sells fun pedal cars and ride-on cars, tractors and unique home decor items. Carl and Cyndi were using Auctiva as a lister and had used one of their templates for years. With the evolution of mobile buyers, we determined the listing template needed to go. Carl loves red and wanted his design to be clean and easy for mobile buyers, but most importantly, he wanted it to be fun and colorful.